Play Wild at Heart online for free now! 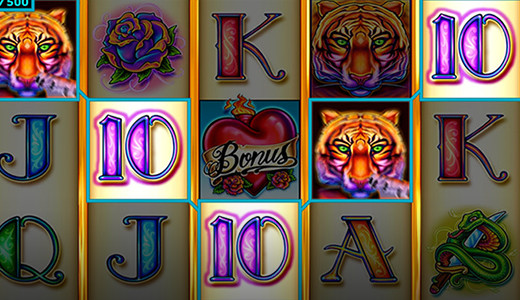 In Wild At Heart™ you face your good fortune on 20 win lines that extend across five reels. The Tiger is the most valuable symbol of the game. Your aim in this game is to land 5 identical symbols on as many win lines as possible. They should run from left to right along the lines in direct contact. Tiger: The Tiger substitutes for any symbol in this game except for the Heart (Scatter) and the Bonus Heart (Bonus symbol). Heart: The Heart acts as Scatter symbol in Wild at Heart and only appears on reels 1, 3, and 5. If you catch sight of 3 Hearts, the free games start for you. The free games start if you win 3 or more Hearts (Scatter) on your playing field. Initially, you have to select one of 5 available game modes: at least 3, 5, 7, 10 or 15 Bonus Hearts in the game. As soon as you have picked a variant your selection becomes active. During free games with each spin you collect Bonus Hearts that have landed; Bonus Hearts only appear on reels 1, 3 and 5. With a little luck the number of Bonus Hearts gathered matches the number you have opted for at the beginning of the free games. If this is the case, your entire free game winnings are multiplied by this number! 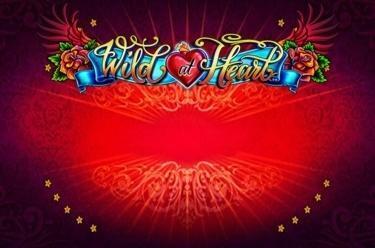 In Wild at Heart, hearts beat faster and winnings grow quicker! Sparkling diamonds, shimmering Tigers and Hearts beating rapidly - this slot has a lot in store and offers exciting and profitable gaming fun! Take good fortune into your own hands and earn free games where total winnings with several win pay outs are waiting for you.